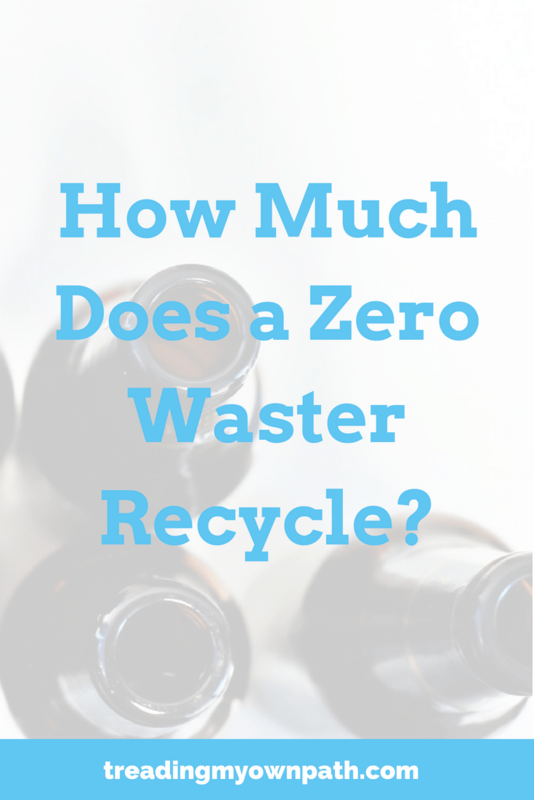 How Much Does a Zero Waster Recycle? The zero waste lifestyle is all about living in a way that creates as little waste as possible. It is often described as “sending nothing to landfill” and most people living the zero waste lifestyle will track their landfill waste. 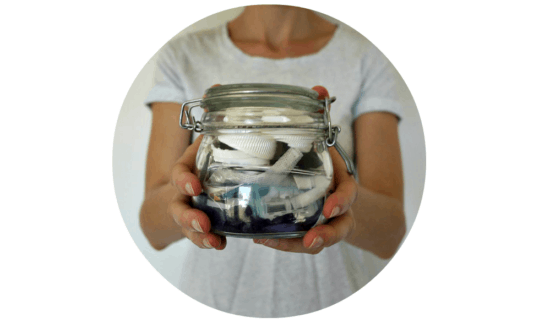 In fact, the jar full of waste has become rather iconic of the zero waste movement. Last year I collected all my own landfill waste in a jar (I shared the contents of my annual trash jar here). I did it as I thought it would be an interesting experiment, and it was. I learned a lot. However, I also think there are some downsides to focusing solely on personal landfill waste. One of those downsides is that zero waste living is not just about reducing landfill. It is about reducing waste overall, and that means reducing our recycling too. The goal is to produce no landfill waste and no recycling either. Yet that is much more challenging, and much less talked about. How much recycling zero wasters produce isn’t discussed as often as it should be. Personally, I think we should be talking about it more. This time last year I decided to record my recycling for an entire month, and share it (view April 2016’s recycling tally). I’ve decided I’m going to make it an annual thing. There’s no particular reason why we chose April last year (I probably thought up the idea in March!). I’m choosing April again this year to keep things consistent. There are no special rules for the month. We don’t do anything differently. That said, I’m sure it is in the back of my mind and I’m subconsciously more careful. Any waste that we (our household consists of two adults and one greyhound) create goes into our recycling bin as normal. After 30 days have passed, I tally it up. I did threaten my husband that I would divide the recycling up into separate piles of mine and his, because he creates more waste than me and I don’t want to be tarnished with the same brush! But really, we are one household, and I think most people can relate to one member of the household being more enthused than the others. 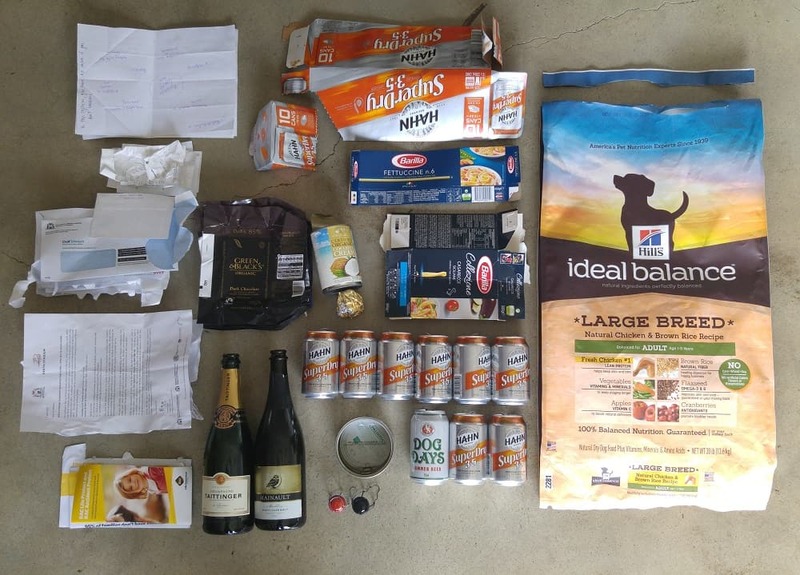 What’s in my (Zero Waste) Recycling Bin? This is a summary of what’s in the bin, from right to left. Plastic Bag of Dog Food: For the first four years of living zero waste we didn’t have a dog Now we do. He is also a dog with a sensitive stomach! We have tried a number of dog food brands. So far this is the one that works best. We get through one bag every 5-6 weeks. I would love to make my own dog food, and maybe one day I will. Right now it is still a little overwhelming. This bag can be recycled via REDcycle at our local supermarket. Aluminium Beer Cans (and their Cardboard Packaging): My husband likes beer. A beer shop locally sells packaging-free beer on tap, but my husband prefers to visit the regular store on the way home from work. I don’t know enough about beer to go the bulk store for him! He chooses aluminium rather than glass as cans are recycled, whereas glass is crushed into road base in WA. Pasta Boxes: My husband also loves pasta. We can get gluten-free pasta (buckwheat spirals and quinoa rice penne) from our local bulk store, and regular vermicelli nests from the small bulk section at our independent grocer. We eat these most of the time. Occasionally my husband will come across Barilla pasta in the cardboard box without the plastic window and will insist on buying it. He’s like some kind of collector! He probably buys one every 3 months or so. We just happened to have two boxes in this month’s recycling. Tin of Coconut Cream: I made crumble recently as we had friends over for dinner. I didn’t have any cashews to make cashew cream, and there wasn’t enough time. My husband dashed to the shops for me and picked this up (at my request). Crumble just doesn’t work dry! Ball of Tin Foil (and Corresponding Chocolate wrappers): Oh, I am so guilty of buying packaged chocolate. I have a weakness for Green & Blacks 85%. I have a serious weakness, in fact: in April I managed to eat my way through 8 bars (as demonstrated by the wrappers). We ate a fair amount of chocolate from the bulk store too. Dolmades Tin: Sometimes I feel like my husband is a packaging fiend! 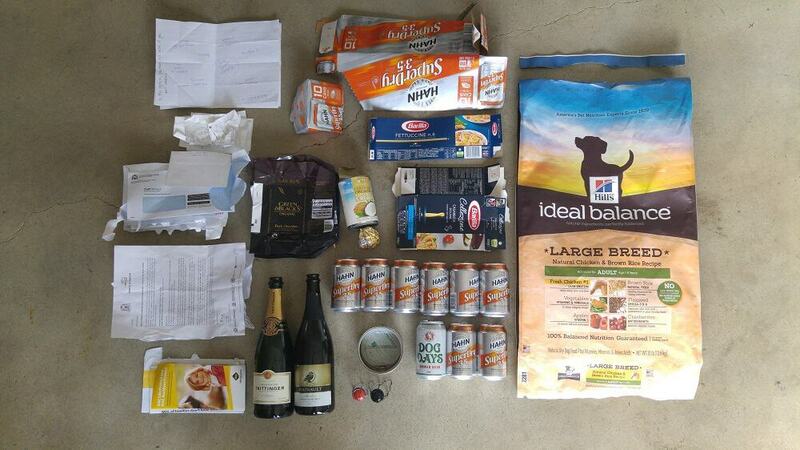 (I realise the packaging he buys is minimal – it’s just a big part of our recycling.) He likes to buy tinned dolmades when we have people round for dinner. It makes me a little bit mad, because I love to cook from scratch and go to all this effort to make home-made food, and then he serves up pre-packaged food. He sees it as a treat! Champagne Bottles and Metal Tops: Our friends brought a bottle of sparkling wine when they came for dinner. The other bottle has been in our fridge for 18 months (it was a moving gift) and needed using up. It was actually pretty flat. The corks have gone in the compost, and the foil is part of the foil ball. Nonsense Promotional Material: We received a pamphlet from the RAC telling us most people don’t have enough insurance. What a waste of paper. Unnecessary Letters in the Post: An enormous water pipe is being installed underneath our road to supply water to the new Perth stadium, and we are sent a weekly letter giving us updates. They’ve been camped out for almost 5 months now, but they are finishing up so we won’t be getting many more notices. Envelopes: We still get the odd thing delivered by post. My husband recently had to renew his driving license (they need renewing every 3 years); some insurance documents that they couldn’t send via email; a new bank card as the old one had expired; and some other things. Till Receipts: Wherever possible we refuse a receipt, but we still pick up a few every month. We recycle them. Some people don’t recycle thermal (BPA- coated) receipts, but I was advised that a few BPA receipts in a container load of paper doesn’t create a problem. Paper from Workshops: I run sustainable living workshops, and use paper for some activities. Some people learn better by physically writing stuff down. As someone who’s partial to taking notes on the back of an envelope, I can relate. I don’t buy new paper, I use reject printing from workplaces, or mail I don’t need. Then I recycle it. Some zero wasters choose to compost all their paper rather than recycling it. That makes the recycling pile much smaller, but in terms of energy, research shows that recycling paper is a better use of the resource than composting. Paper production is enormously energy intensive and recycling paper helps slow down new paper production. Whilst I live in a city with good recycling infrastructure, I will always choose to recycle my paper over composting it.The only paper I compost is paper that cannot be recycled: anything stained by food or grease, tiny scraps, or shredded paper. Whilst I’d love to see our recycling drop to zero, it’s heartening to know that we created less than this time less year. Some people say that “near-o waste” is a more accurate term than zero waste, and I’m inclined to agree. However, that doesn’t stop me aiming for zero. Please tell me what you think! Do you find tracking your waste and recycling a helpful tool? Or is the extra fuss and effort too much hassle? Do you find seeing pictures of others’ waste inspiring, or do you find it demotivating? Is there something else you find more motivating? I’d love to hear what you think so please leave me a comment below! 41 Comments • Leave a comment! 41 Responses to How Much Does a Zero Waster Recycle? Hi – I’ve been reading your blog for a few months now (I’ve been on my own waste-free journey for the past year) and I was wondering if you could share more of your knowledge on recycling? I don’t use hard plastics (such as nutlex containers) but someone recently told me foil is harder to recycle! I really have no idea about what is best! Hi Cassandra, thanks for your comment and great question…but do you know you are opening a can of worms?! And that I will still be talking about it next week?! The first question is always – where do you live? Lots of things are “theoretically recyclable” but that is not the same as actually recycled where you live. The second question is to find out who exactly recycles your waste. Your local council likely contract out another company, and you can find out who they are and where the depot is, and what they will recycle and what they won’t. Just knowing what you’re allowed to put in your bin isn’t enough. For examples, some councils in Perth will let residents put all types of plastic 1-7 and plastic bags in their recycling bins, yet another council who uses the exact same contractor will request residents only place plastics 1,2, 4 and 5 in the bin. That doesn’t mean that the first council is actually recycling more. They do this to encourage people to recycle, stop them feeling stressed and overwhelmed about what is recycled and what isn’t. It also establishes good behaviours so when these plastics do have a market and can be recycled (as in, it is cost-effective to do so) people are already in the habit. The next thing you can do is actually try to go on a tour of your local recycling place! Lots of them do tours for the public and it is worth seeing exactly what happens and how it works. Some modern ones have fancy lasers to separate waste. Others rely more on hand pickers (real people) to pick stuff out. When you say foil, if you mean actual metal foil, it is made of aluminium and can be recycled so long as it is big enough to be picked up by a hand picker as they would a coke can. So save it up until it is a ball the size of an easter egg, and then recycle it. If you mean butter wrappers, they are foil and paper and would be harder to recycle. Anything made of mixed materials is harder to recycle. With tins, it’s worth trying to avoid the plastic-lined BPA tins (not an easy feat)! The plastic will most likely be burnt off when they are processed and burned plastic is pretty yuck. What things do you still buy in tins? I can try to think of some alternatives if that helps! :) Hope this was a good starting point for you! Thanks so much for your detailed response! I’m in Maribynong Victoria and I do shop at my local bulk stores for most things and have my fruit and veg delivered from CERES fair food but occasionally I don’t remember to soak my beans or I don’t have fresh tomatos and need tinned and I buy them in tins (I always get organic but I will check next time if they are BPA free!) I will definitely check out my local council to see if I can find out more and tour the plant. Thank you for all the tips – you’re amazing! Hi there! I did some research on it a while ago to write a blog post that I never finished, but I can’t find my reference list now. I’d suggest googling it and finding the references/papers that way. Sorry I can’t be more help! Thanks… I was just being lazy really, but it’s an interesting fact that I shall try to pin down. Hehe, no worries, sorry I couldn’t help! This is so interesting. I am aiming to reduce waste little by little and do what I can to buy local packaging free things. But I have been wondering about recycling and zero waste. My boyfriend (who also likes beer) has fallen in love with the Klean Kanteen growlers that you can have your beer filled into. Maybe your husband could teach you about what he likes and he could sample the beer? Just an idea. As for dog food, we’ve been feeding our dog with a sensitive stomach home “cooked” food – meat leftovers from a local butchers are a good starting point maybe, just make sure the dog gets all the nutrients etc. that he might need. We actually have two Klean Kanteen growlers which we use to save tap water when we’re running the hot tap. The beer shop near us have their own glass growlers, and they have a return system so you don’t actually fill the bottle you “own” but swap it for a sterile one. They have some high-tech gadgetry so they can fill the bottles and put gas in the top so it won’t go bad for a couple of months. Rather than buying it at the bar when it needs to be drunk within 24 hours. The other thing with the beer shop is that they have 8 kegs, but they rotate it all the time with specialty and imported beers. I could probably give it a go and find out if I’m making the correct choices ;) I think I will give it a go. RE the dog food, we did go to both of our local butchers but one doesn’t have a counter, you have to pre-order so it would all be packaged. And the other was quite rude when we said we were vegetarian and asked for advice. I gave the owner my phone number as he was going to check something out and get back to me and he never bothered. Not keen to support businesses like that. I’m sure I will get there eventually! Maybe it’s time to give it another go! Thanks for the suggestions Anna! Thanks for sharing and being so real and not perfect! I´m Italian and I would suggest your husband not to buy Barilla because it ´s really bad quality and not organic at all! I will pass your feedback on! Oh no! I have been buying it because it’s plastic free (though I was thinking about stopping because of the recycling energy and ink waste associated with it). I will definitely stop now! Might have to start making my own pasta. This is amazing Lindsay- we still make a standard amount of recycling… it’s the next thing to start working on. I notice a lot less toilet paper wrappers in your lot this year… Hans poos? The bane of my existence at the moment is receipts. I refuse them where I can, but my husband just grabs them. I was recycling them, but when I put in a formal complaint to council about their receipts for parking meters that were printed on plastic! I complained that they aren’t recyclable and said that I shouldn’t be recycling regular receipts anyway because of the BPA. what the council says goes- because as you’ve said each community has different rules. I recently sold my car and cleaned out both my husbands car and my now sold car and found yet more receipts. I feel like I have millions of them. I have been putting off the paper declutter- even though it’s high impact I find paper decluttering painful. Sorry to be the bearer of bad news about the pasta :/ Yep, we use the wrappers for Hans’ toilet business. And then compost in the dog poo worm farm. I wonder actually if there is a bit of a backlog of toilet roll tubes somewhere! My husband has a tendency to chuck them in the cupboard, so I might open it up to find about 15 in there! Although this time of year, as we are planting seedlings, we do use them in the garden. I didn’t know I could put wine corks in the compost! Thanks for the info! I think thy break down very, very slowly Holly! If you have lots, you could try passing them on to crafty types, that might be a better use as they are being reused. But if it’s just a few, compost is the way to go! Your recycling looks more ‘normal’ to me. Lately, I tend to have a similar bit of unwanted mail. Other than that, it’s yoghurt and ice cream containers. My landfill for the year wouldn’t fit in a jar, but it is still fairly minimal considering near-0 waste was never a goal, just a nice accident. It is normal, Mel! ;) Yes ,there are definitely things that we can’t avoid. You know, zero waste wasn’t really a goal for me either. I went plastic-free and started buying stuff in glass and cardboard. Then I started noticing how much packaging I was consuming and decided to try to avoid it all. It was only much later that I heard “zero waste” was a thing! A nice accident indeed! What’s your near-o waste story Mel? Think about how you can use those plastic yoghurt and ice cream containers around the home. We use them to store all sorts of small things in, in drawers and cupboards, and out in the shed. I keep a small collection of the yoghurt containers just in case 1 splits, which then goes into recycling. It drives me mad that 1. My flatmate seldom washes out recycling containers so therefore 2. He’ll put them in general waste! AND… the rubbish chute is for general waste, you have to walk your recycling down. Such an oversight… meaning lazy people end up not preferring to recycle AT ALL. That would drive me mad too, Sarah! Physical barriers like that make such a difference to anyone on the border. Make the right things easy for people, every time! Hi Lindsay. Thank you for your posts. I try to recycle as much as possible and I don’t even put my bins out until they are completely full. I also recycle paper from home printing…if there is a space available to write on, it gets used until there’s no room left. I have seen on the internet/FB, that recycling junk mail (sales ads) by way of filling a bucket with paper and rainwater (what little we get here in WA! HAHA!). Once it has been soaking for a while, we mix it up, let it dry out and use it for fire starters. I’ve also got a small indoor wheelie bin, that we put bills/notices/etc into to eventually breakdown for fire starters. We also save our empty toilet rolls for the fire too. We always rinse out used tins/butter containers and such before placing in the recycle bin. I love cooking, but haven’t made my way to really cooking from scratch. And we also try to eat as many salads during the week, for health and to lessen waste. But I feel that we have a long way to go to get to zero waste or even minimal waste. Could anyone tell me what they do with rubber bands? I hate throwing them out as I worry about wildlife consuming them and I have no idea if they break down. Always room for improve, but great success! We have little waste, but lots of recycling, which can seem like we are doing nothing to minimize our waste. Maybe homemade dog food could be your next experiment. My sister makes a mix of meat with rice and veggies for her dogs, which she freezes. Helps a lot with pets with health issues. It may seem to take up a lot of time, but once you have a system done, it’s easy. For good compost brown matter (dead brown leaves, shredded branches, mulch, paper, cardboard) is as important as green matter. If you recycle your paper what do you do for brown matter in your compost? Hi Gayla, great thoughts! We have heaps of dead leaves, branches, dead bits of plants etc that we use. We rake up leaves from the local park, and we always dry our garden prunings and add them to the compost dry. I’ve found that cardboard isn’t the best at composting anyway (from composting an old pizza box). I prefer sticks and leaves as they keep it more aerated. I do park pick ups too, but since dry leaves are only available in fall and winter I was wondering if my compost was getting enough brown matter. I think I’ll stay away from cardboard if you say it doesn’t rot very well. I do add newspapers since my kitchen bin is lined with them. Here a lot of the trees are evergreen, but because it is so hot they still seem to lose leaves in summer, so we always have enough. There are lots of very big trees too, so whilst they only lose a relatively few leaves, it amounts to quite a lot. I find cardboard goes kinda slimy and seems to take forever to break down, but then again I don’t tear it up, which would help! We also get shredded paper from offices sometimes, as this isn’t recyclable unless though a dedicated shredded paper system (it sticks to everything and contaminates it). But if I didn’t have enough natural or waste carbon, I would compost cardboard. We sometimes use cardboard for sheet mulching (ie to suppress weeds). If you use cardboard, be sure to tear it up into strips! Maybe soaking it in water and tearing would work best. I guess I’m not a true zero-waster then cause I buy a lot of cans of beans, corn and sometimes chickpeas. I do buy bulk as well, but sometimes I don’t have time for soaking, and I’m not always home either (going to a race, last week was training camp, etc). I still didn’t find bulk option for dark chocolate either, so I buy that as well, in cardboard and foil packaging. Hi Dóri, I don’t know what a “true” zero waster is, but if you aspire to the lifestyle and try to reduce your waste as much as you can, then I say you are! ;) Realistically everyone buys something in packaging. You get my vote! You don’t need to throw it out! Generally if a compost seems too wet, add dry stuff, and if it seems too dry, add wet stuff. It isn’t the end of the world if it has midges, just less pleasant! You need a lot of dry stuff to counter the wet food scraps. Maybe add cardboard, rake some leaves off the ground. Can you get hold of shredded paper? Coffee grounds from a cafe can help too, especially if they are dry. They are a good compost activator too. We get sackfuls from ours a few times a year. Good luck! I find it frustrating that the rules for recycling change from state to state, even council areas can differ in what they accept. And where do we recycle polystyrene? No-one I’ve asked can tell me. Hi Darren! Some landfill sites will accept polystyrene – I know for example that Rockingham landfill site does in Perth. We also have a place in Welshpool that specialises in plastic recycling, and they take all types of polystyrene except the black meat trays (the lowest quality). I’d suggest ringing your local council waste team to ask, or googling plastic recyclers in your area. Hope that helps! I am very far from zero (focusing on the BeZero mantra of make less trash 2017 than the zero part) but I’m really trying to be conscious of reducing my recycling. I have gotten to a bag every two weeks down from weekly, and I think I can realistically get to one a month by the end of the year. It is really left out of this conversation as though the city my parents live in does have a really good recycling program they reay use it as a crutch. I am trying to pass the message that recycling shouldn’t be the final solution nor is it the holy grail while balancing not discounting their efforts in diverting waste from landfill by trying to be very complient with the recycling program. Hmmmm… Brenna, I think you just hit on the “point” I’ve been missing. If you don’t buy it, you don’t have to worry about if you can recycle it. Thanks! You mentioned crushed glass for roads in WA. Are you from here? I only ask because I had assumed you were Canada or Australia or “somewhere far away” and informational resources are so different, even county to county, that it changes the perspective of the information you’re providing. To me, at least. I do want to thank you for Plastic Free July awareness. I read about it here, alas not until June 30th so all I really managed was awareness and a bunch of extra guilt. I think that’s a great start actually! I’ve been slowly transitioning my choices for the last few years and would like to move forward faster… just looking for more localized resources. I have spoken with our head outreach guy for Waste Management but, although hes offered a tour of the Spokane Facility, he’s really only guiding me back to resources I already know and find lacking. Hi Leona! I am from Western Australia (WA). I know there are other “WA”s out there! I’m not sure where “here” is for you, but I guess not Australia?! Yes, you’re right, everything changes from council to council, region to region, state to state. But there are some common premises. Technically recyclable does not mean actually recycled, for a start! And a company accepting products in its recycling does not guarantee they will be recycled. It is all dependent on market. Here they work with 3 month contracts I think, so it can change (and does change) often. If no-one wants to buy the stuff, it won’t be recycled. That’s great – awareness is the first step! Keep on going. And keep asking questions. Keep pushing and you’ll get them!